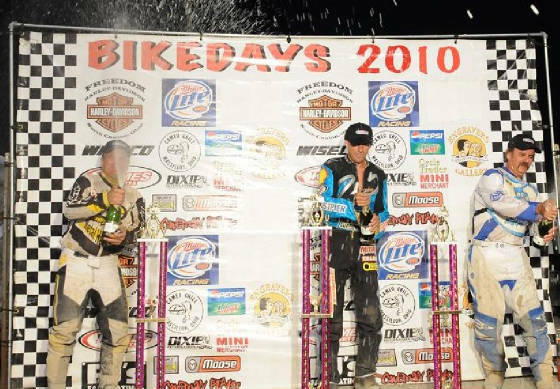 Jeff Orosz came out on top at the Speedway Long Track National Championship Round II, Friday July 16, 2010 at the Fulton County Fairgrounds in Wauseon, Ohio. The Long Track National was organized by Scotty Brown and the Bike Days Motorcycle Club www.bikedays.com and is sponsored by Applied Innovations, Barnett Clutch, Dixie International, K-K Motorcycle Supply, Kames Sports, Moose Racing, Oury Grip, PJ's Fabricating, and Wiseco Piston. 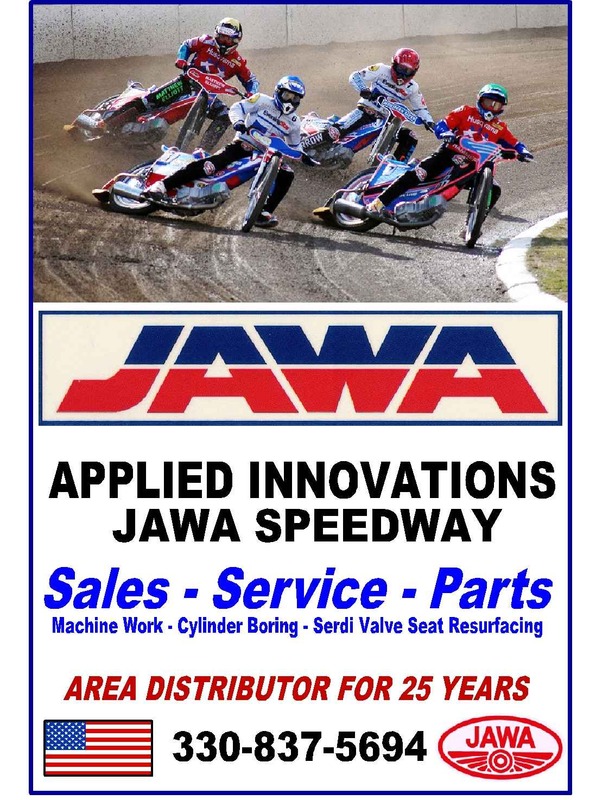 The Speedway Long Track National ran in conjunction with the Wauseon National Antique Flat Track Motorcycle Races at the Antique Motorcycle Club of America (AMCA) 28th annual Wauseon National meet. It was a hot and sunny 89 degree day, with perfect conditions on the half mile limestone cushion track. 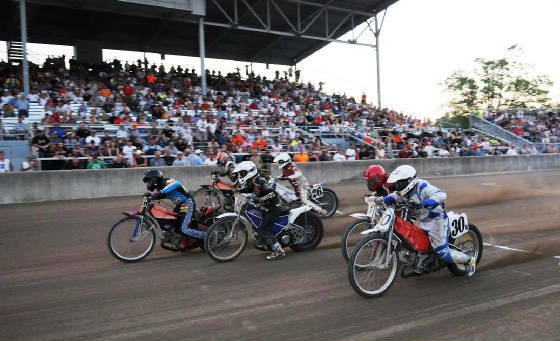 North America's finest Long Track Riders assembled in Wauseon after traveling in from Illinois, Indiana, Michigan, Ohio, Pennsylvania and Canada to compete in Round II (final round) of the National Championship. ESPN2's Speedworld announcer Griff Allen was on hand to call the action. Round II of the Speedway Long Track National consisted of three rounds of point gathering Heats, a Last Chance Qualifier, and an "A and B" Main. The heat race points were tabulated, transferring the top four riders into the A Main, leaving two positions open for the top two finishers from the Last Chance Qualifier. 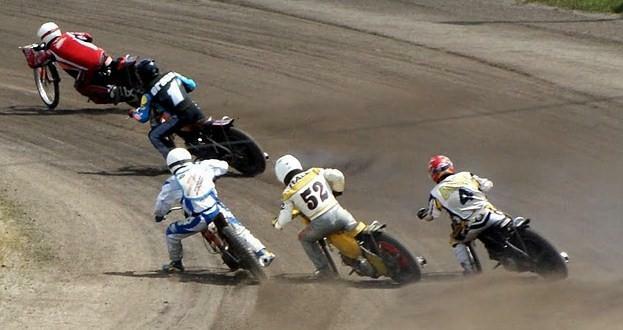 In case of a tie, the winner is the rider with the better finishing position in the 3rd round of heats. Jeff Orosz scored 22 points. Stephen Brinker and Jesse Diem tied with 18 points. Indiana's Dave Weicht scored 15 points. Warren Diem, Chris Hathaway, and Dan Weicht tied with 13 points. Michael Callen scored 12 points with Kevin Sexton at 9, and Michael DeChamplain at 7. #1 Jeff Orosz (CAN) won the A Main wire to wire at the Speedway Long Track National Championship Round II in Wauseon, Ohio. Warren Diem struggled in the heats with mechanical issues, then borrowed Jeff Orosz back-up bike to win the LCQ with Dan Weicht in second, transferring them to the A Main. The remaining four riders from the LCQ (3rd through 6th), transferred to the B Main. 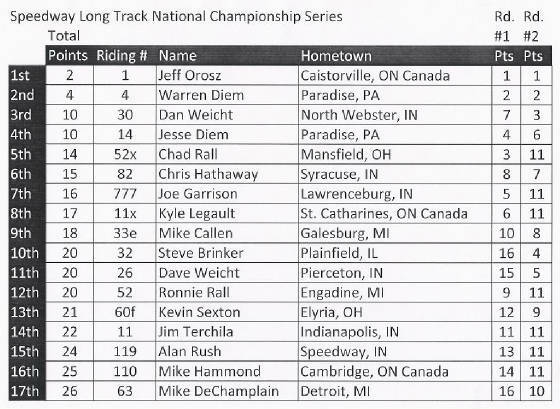 The top six riders leave the line in the A Main at the Speedway Long Track National Championship Round II in Wauseon, Ohio. In the A Main final - Jeff Orosz took the early advantage with a great start. #14 Jesse Diem ran second with #4 Warren Diem third and #30 Dan Weicht fourth. Warren Diem 7 time NY State Champion found the traction needed coming off turn two to pass his son Jesse on the back straight and move to second. Jesse maintained third until the beginning of lap two when a broken primary chain ended his chances to get on the podium. #30 Dan Weicht took over the third position and held it to the checkered flag. #32 Stephen Brinker put in an excellent ride to finish fourth, and #26 Dave Weicht finished the LT National with a very respectful fifth. Orosz was the first to cross the finish line and win the final round of the Championship clinching the championship. Orosz has won the Speedway Long Track National Championship for the last three years, and now has won it an amazing four in a row. In the B Main final - Chris Hathaway won the race wire to wire, with Michael Callen in second, Sexton third, and De Champlain in the wrap up position. 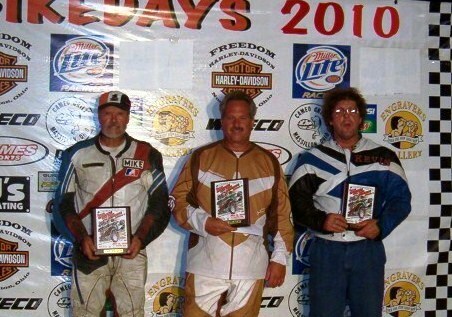 The B Main Speedway Long Track National Champion Chris Hathaway (center) with runner up Mike Callen (left), and third place finisher Kevin Sexton (right) after the Speedway Long Track National Championship. 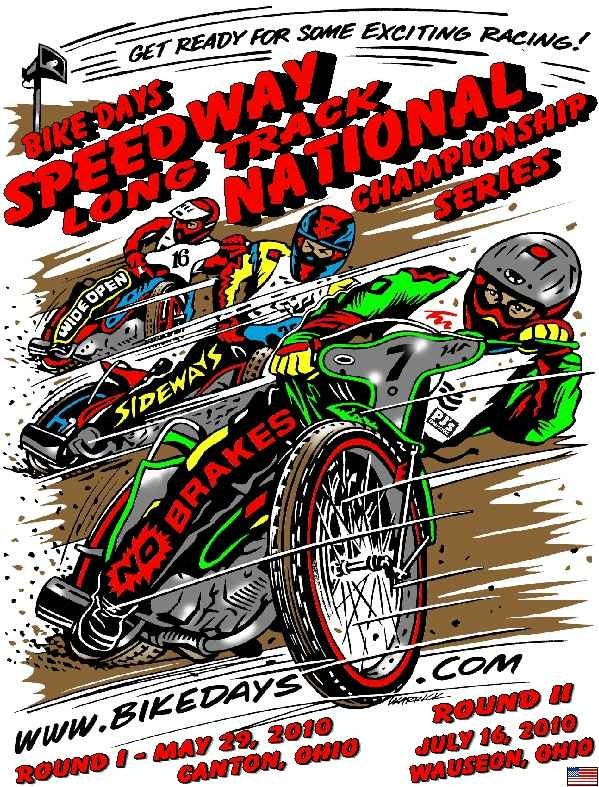 Visit www.bikedays.com for information on the 2011 Speedway Long Track Nationals. Jeff Orosz came out on top at the Speedway Long Track National Championship Round I, Saturday May 29, 2010 at the Stark County Fairgrounds in Canton, Ohio. The Long Track National was organized by Scotty Brown and the Bike Days Motorcycle Club www.bikedays.com and is sponsored by Freedom Harley Davidson, Miller Lite Racing, Applied Innovations, Barnett Clutch, Dixie International, K-K Motorcycle Supply, Kames Sports, Moose Racing, Oury Grip, PJ's Fabricating, and Wiseco Piston. 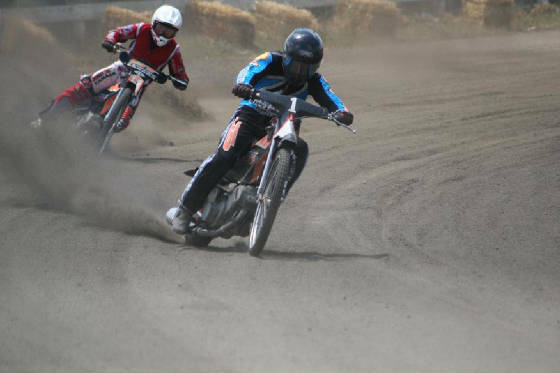 The Speedway National ran in conjunction with the Classic Flat Track National Championship Series at the BIKE DAYS 7th annual meet. It was a warm and sunny 84 degree Memorial Weekend, with perfect conditions on the half mile limestone cushion track. North America's finest Long Track Riders assembled in Canton after traveling in from Indiana, Michigan, Ohio, Pennsylvania and Canada to compete in the first round of the National Championship. Brian Fowler of the Brian and Joe radio show and Bob Sigler from Outlaw Motorsports were the announcers on hand to call the action. 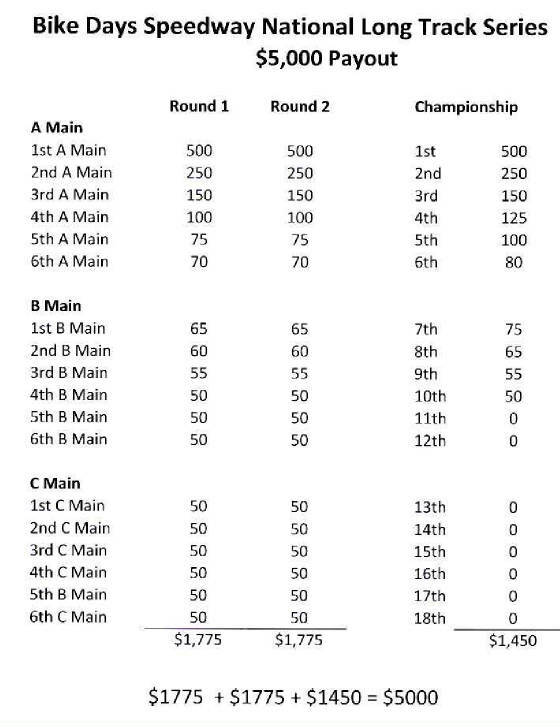 The National Long Track format consisted of three rounds of point gathering Heats, two Last Chance Qualifiers, two Semi Finals and an "A and B" Main. Kyle Legault who rides for the Newport Wasps in the British Speedway's Premier League rode flawless through the heats earning him the maximum 26 points. Reigning Champion and three time winner of the LT National Jeff Orosz scored 24 points. Warren Diem 7 time NY State Champion scored 21 points. Chad Rall 2 time Ohio State Champion (son of Hall of Fame Rider Ronnie Rall) and Jesse Diem tied with 20 points. Indiana's Joe Garrison made the cut by scoring 17 points. The heat race points were tabulated, transferring these top six riders into two Semi Finals, leaving six positions open for the top three finishers from each of the Last Chance Qualifiers. Dan Weicht won the first LCQ with "AMA Hall of Fame rider" Ronnie Rall in second and Michael Callen also making the cut by finishing third. Alan Rush coming back from a shoulder injury won the second LCQ, with Jim Terchila taking second and the third and final transfer position going to Kevin Sexton. In the first Semi Final, Kyle Legault won wire to wire, followed by Chad Rall and Jesse Diem, transferring them directly to the A Main. In the second Semi Final, Jeff Orosz took the top position, with Warren Diem second and Joe Garrison third, also transferring them directly to the A Main. In the A final - Kyle Legault took the early advantage with a great start. Jeff Orosz trailed in second and Chad Rall in third. Legault's bike sputtered and died (from lack of fuel) after the first lap, allowing Orosz to take the lead. Diem made a great charge to pass Rall for second, Orosz was the first to cross the finish line and win the first round of the Championship. Orosz has won the Speedway Long Track National Championship for the last three years, and is in an excellent position to make it four in a row. Round II of the Speedway Long Track National Championship will be held on Friday, July 16, 2010. 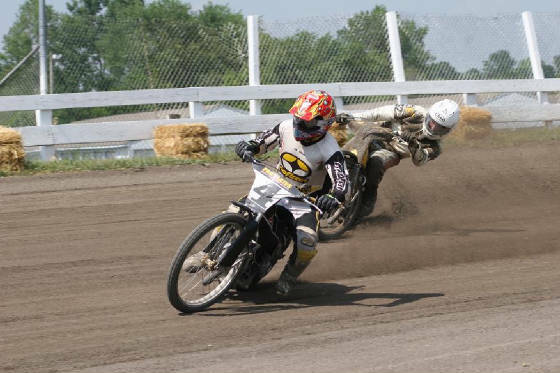 The championship will be combined with a great night of Antique Motorcycle racing at the 28th annual AMCA National meet at the Fulton County Fairgrounds in Wauseon, Ohio. at Bike Days in Canton, Ohio. In case of a tie, the winner is the rider with the better finishing position in Round 2.